Today's New Coupon Roundup: $0.50/1 Scotch-Brite, $1/2 Kellogg's or Keebler + More! 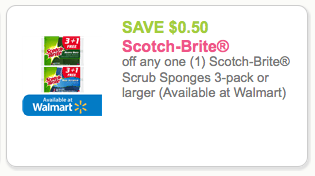 SAVE $0.50 off any one (1) Scotch-Brite® Scrub Sponges 3-pack or larger (Available at Walmart) - a great doubler! $1/2 any Kellogg’s, Keebler or Sunshine Cheez-It Baked Snacks Product 3.48oz or larger Bricks coupon - rare!